Wire Rope and Accessories - Marine, Architectural, Home and Industrial Applications. If you require help, information or any kind of further assistance, call 01903 762138 or Email. Beautiful stainless steel handrails to enhance any staircase, home or office. Standard lengths or made to measure. Made to measure in our workshops. 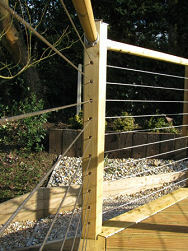 Ideal for decking balustrade and pergola infill. Can be used for internal and external projects. 42mm Diameter Handrails - 304 Grade Satin Finished Stainless Steel. All handrails are supplied with wall brackets and stainless screws. Allow up to 1 week for delivery. Stainless steel and galvanised rigging to order, small qty's and large batches. Stainless steel balustrade manufacture, supply and installation services. From the smallest home system to full commercial installations.